Sometimes a players greatness is flat out forgotten or lost in the shuffle of other great players; such is the case with Kiki Vandeweghe. Vandeweghe played in an era where stars were plentiful and was often relegated to smaller markets during his best years. Yet, he was still able to become an all-star and be remembered by diehard NBA fans. Rarely does a star at UCLA go unnoticed, but to some degree Vandeweghe did. He lead the Bruins to the 1980 NCAA title game where they lost to Louisville and despite putting up nearly 20 points a game was a senior fell to 11th in the draft. Upon entering the NBA Vandeweghe immediately caused a controversy by refusing to play for the Dallas Mavericks and demanding a trade. He got his wish and later that season was traded to the Denver Nuggets. Mavericks fans never forgot nor forgave Vandeweghe and to this day if he enters the arena he is booed. 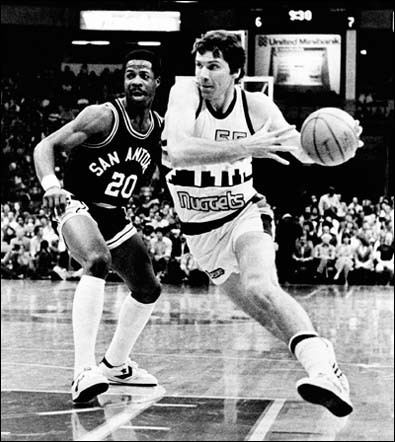 Vandeweghe had a solid rookie campaign with the Nuggets averaging 11 points a game and 5 rebounds. In his second year his scoring jumped by 10 points per game as he made the all-star team for the first time and the Nuggets made a deep NBA playoff run. In 83-84 Vandeweghe averaged a career high 29 points a game and made his second all-star game, but following the season he was traded to the Portland Trailblazers for a package that included Fat Lever. In Portland he paired with Clyde Drexler and his addition may have played a factor in why the Blazers went with Sam Bowie at #2 in the 84 NBA draft over Michael Jordan. The duo of Vandeweghe and Drexler became one of the highest scoring backcourt duo’s in the NBA in the 1980s. The duo lasted only three years before Vandeweghe suffered a back injury causing him to lose his starting job to Jerome Kersey. Half way through the following season the Blazers traded Vandeweghe to the Knicks. Vandeweghe had some familiarity to New York, his father had played his entire NBA career with the Knicks and he had spent part of his youth there. Vandeweghe became a role player on a Knicks team lead by Patrick Ewing. Unfortunately for Vandeweghe the back injury suffered with Portland became a constant factor in his life as he missed large parts of several seasons with the Knicks. After three and a half seasons with the Knicks he signed with the Los Angeles Clippers and played his finally 41 games there before retiring. Vandeweghe has a career average of 20 points, 3 rebounds and 2 assists per game in 810 career contests. Following his playing days Vandeweghe got into the front office of, ironically enough, the Dallas Mavericks. He was instrumental in bringing in fellow Germany born player Dirk Nowitzki. Vandeweghe than became GM of the Denver Nuggets. In 2006 he left the Nuggets and a year later was hired by the New Jersey Nets. In 2009 he took over as coach of the Nets, he went 12-52 in his only season with the Nets.